Who doesn’t love handheld food? Let’s be real. It’s easy to grab something to-go for someone with a busy work schedule or children. 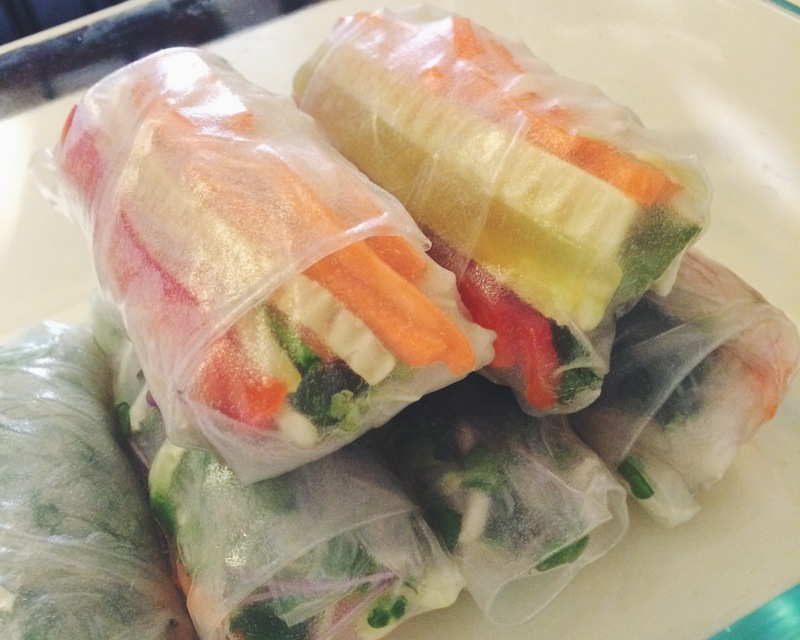 Most options for these quick bites are not so great for you or your waistline, but these fresh Thai-inspired salad rolls are great! They are light, refreshing and fill you up without weighing you down, literally. And with the summer months quickly approaching for another scorching Texas summer, this recipe is perfect. It just takes a little time and love and you’re golden. A fun fact about me, I love Thai food! All kinds! Traditional, fusion, street-style, it’s all good to me! So when I went out to a Thai restaurant for a friend’s birthday recently, while scouring the menu for my meal, I noticed that most of the rolls that they offered were deep friend of filled with some greasy (yet still delicious) fillings with oily dipping sauces. Even the salad rolls they had were filled with meat, which I love but don’t eat a whole lot of. 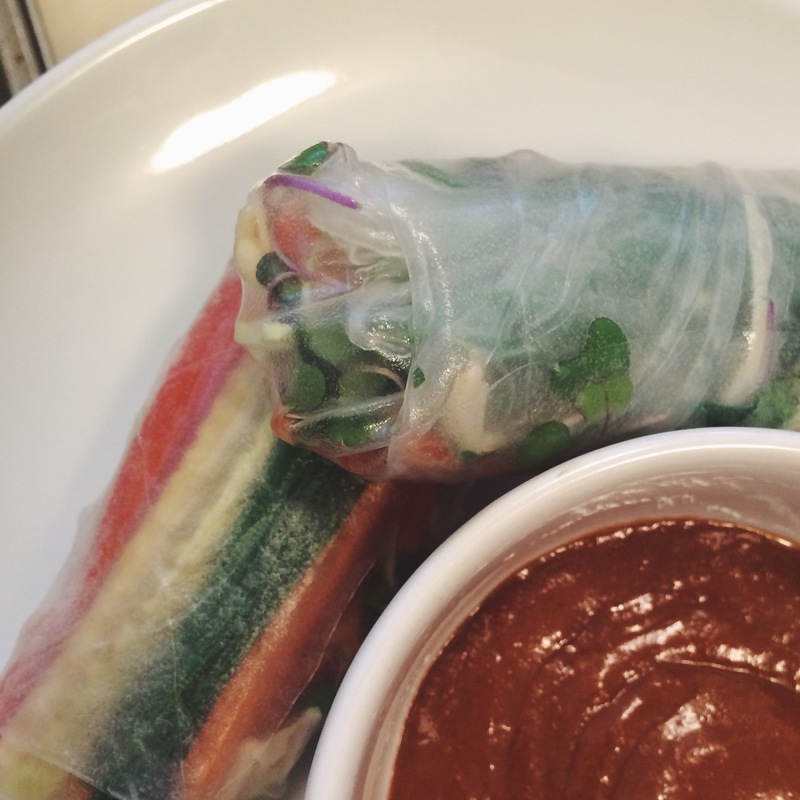 So I decided to go home and make my own salad rolls filled with nothing but, well, salad. And let me tell you, I was pretty proud of my accomplishment. These can take time, but they’re worth it! And they’re entirely customizable. 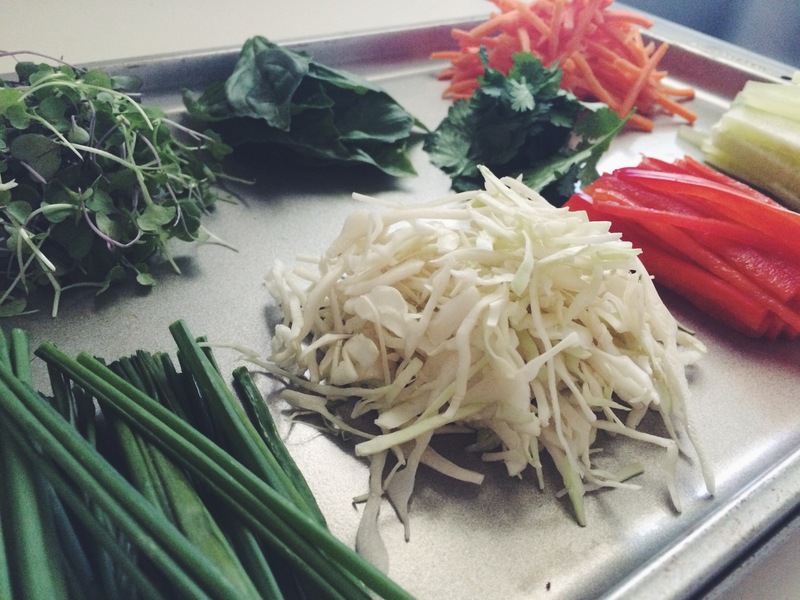 Start with your mise en place (your prep). This will make assembly go quickly and efficiently, which is great if you don’t want to spend your entire afternoon in the kitchen. That’s a dream to me, but not everyone feels the same! After washing and drying them, I cut all of my veggies to about 3 inches in length for uniformity. You want to get a bit of everything in each bite, right? Pick off about 1/2 cup of cilantro and pick off your basil leaves but keep them whole. Once all that’s in its place, you’re ready to roll! (see what I did there?) 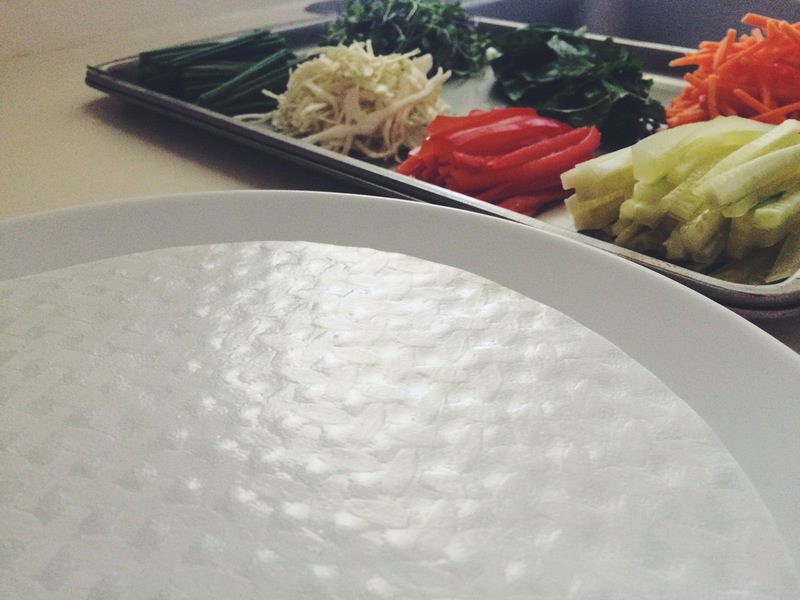 Take one rice paper wrapper and soak it in a plate of warm water for about 5 seconds. Remove it and place it on a flat surface. 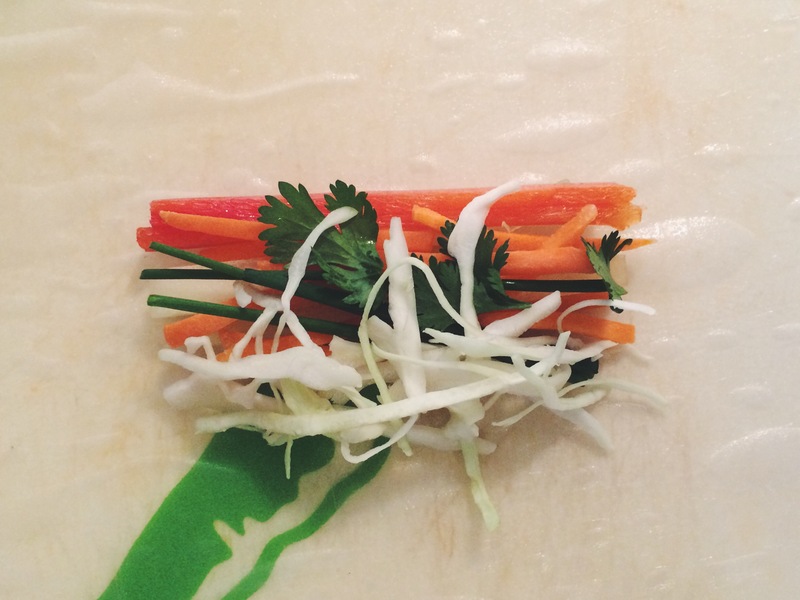 Take a little bit of each ingredient and place them in the center of the wrapper. 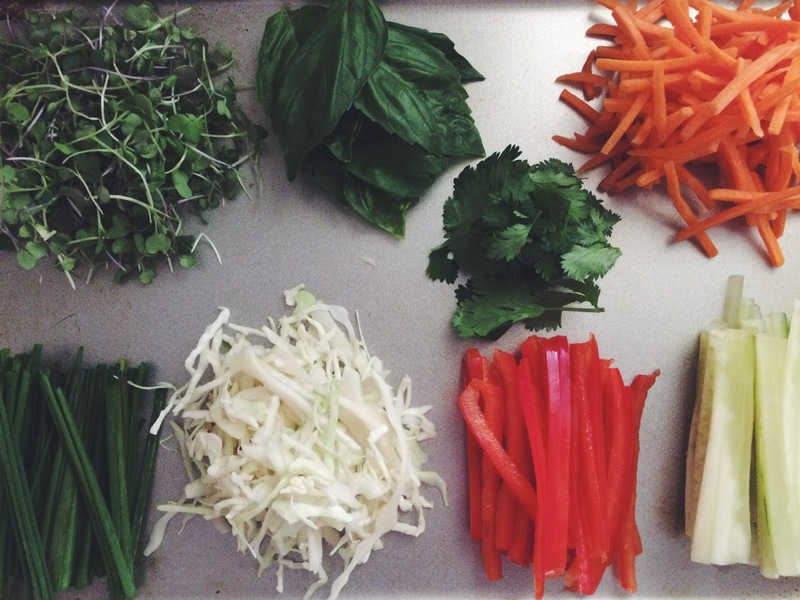 Top off with the basil leaf, because it makes it pretty. Gently begin to roll one side of the wrapper over the ingredients, tucking the edge under the filling. Take the sides and fold them in over the filling, like a burrito. Then roll the whole thing up tightly but gently, being careful not to tear the delicate wrapper. Then do that until you run out of ingredients! Seriously! Mine made 10. Helpful Hint: I love cooking with herbs. It’s a great trick to take out unnecessary fats and sugars without removing flavor. Healthy food doesn’t have to be bland if you know how to season food. Get creative, mix in herbs and spices that you enjoy eating, just be careful of that salt shaker. It looks healthy and yummy!